We had a programming exercise this week at work. 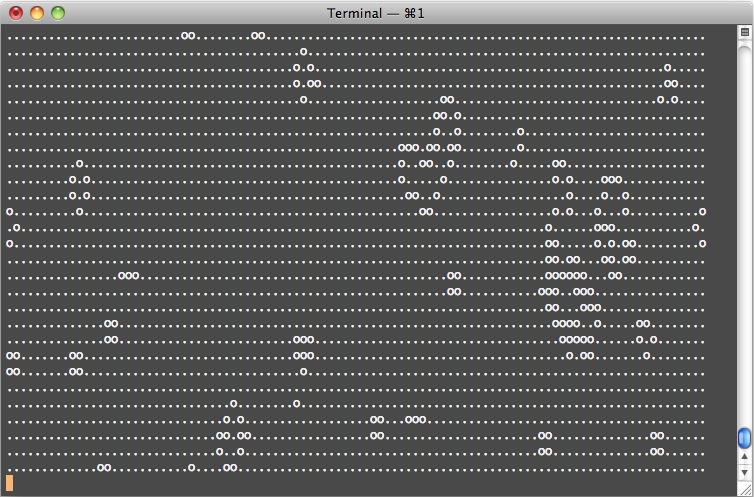 We were set out to write Conway's Game of Life, using pair programming and TDD. It was a fun and educational evening. I even did some Scala. Programmers humor dictates me that from time to time I say things like "In Ruby, that's only one line!" or "In Ruby, that would cost me just one minute!". Putting money where my mouth is, I wrote the entire application in just one line of Ruby. So here it is. It looks more like Perl than Ruby. But it works! I didn't cheat! No semicolons where harmed during the making of the spaghetti code. I did enter some newlines in the code shown above to prevent wild scrollbars from appearing. If you want to know how it works, or make an animation of it, it's all here.